The work we've been doing on the new front doors has involved quite a bit of restoration. 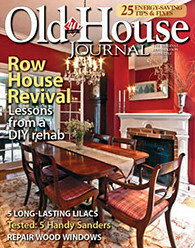 Not only has this restoration applied to the salvaged items we've purchased, but also to the portions of the house which were already in place. This has included paint stripping, plastering, tiling, wood rot repair, and even a little ingenuity. We'll be installing the new outer french doors in a location that previously, at some point in the history of our home, had double doors. This means that there are already mortises for the hinges that we'll be installing, but it also means that various hinges have occupied this location and the mortises have been drilled and re-drilled time and again, leaving a swiss cheese of wood that can't hold a screw. Obviously, swiss cheese isn't a good basis for hanging a door, so this situation needed to be rectified. I decided to use an old trick that I learned some time ago to take care of this issue, and I thought it might be useful to pass my trick onto anyone wo might read this post. When a door jamb has been over drilled, you end up with too many screw holes that are too large and really don't serve much of a purpose. To correct this, you need to fill these holes with a material that can actually hold a screw. 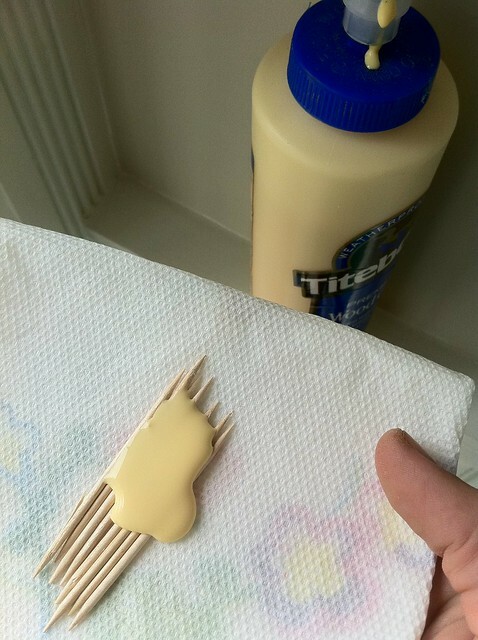 Regular wood filler or epoxy fillers are typically too soft or brittle to give a screw a solid hold, and has the tendency to pull out rather than stay in place. To really correct this sort of a situation, you need to fill the holes with something that will act sort of like a plastic wall anchor does inside of drywall or masonry, and you need this filler to be solid and fixed in its position without risk of coming out. To provide the backing and solid foundation for screws I like to use toothpicks and wood glue. No joke, simple toothpicks and standard wood glue is all the door doctor ordered. You can use this trick on large or small screw holes, and it is rather simple to tackle. The tools you'll need for this little job are simple. The first step is to dry fit the hole you are working to fill with the toothpicks. This will give you a sense of the number of toothpicks you'll need for each hole. The fit should be very tight. Next, grab a paper towel and the wood glue. Remove the toothpicks from the hole and apply a generous amount of glue to the bottom of the toothpicks. Spread the glue around on the toothpicks to be sure it gets between everything. Pick up the toothpicks with the glue on them and fit them into the open hole. If they won't all go in, put half in then fill with the remaining toothpicks. Once the toothpicks are loosely fit, use the small hammer to tap the sticks a bit deeper into the hole. This is where the real hold of this approach comes in. The toothpicks get pressurized in the hole with the glue, and as the glue dries, the toothpicks swell a bit more and completely fill the opening. If much of the glue oozes out, make sure you wipe it up with the paper towels, you don't want to deal with it after it dries in lumps. Once the glue fully dries (give it at least a day because it is so thick) use a chisel, small saw, or utility knife and blade to cut the toothpicks flush to the mortised opening. Once they're all cut just sand the toothpicks smooth and you are ready to drill your next set of holes for your hinges. 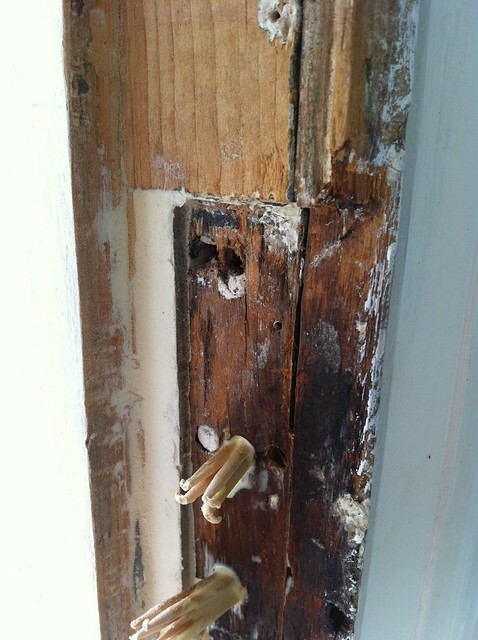 The following photo is of another hinge location where I used the toothpicks and epoxy wood filler to fill in the old mortise. It was very rotted, so this approach gave additional backing. Now is nice and smooth after sanding. When you're all set with sanding and drilling your new screw locations, you're ready to mount your hinges. As you insert the screws for the hinges, the screw will push against the toothpicks in the opening and will securely hold whatever you need them to. 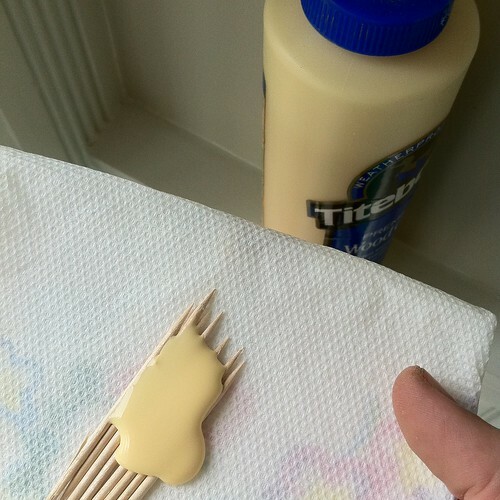 The glue dries as hard as wood and will be solid for many years. I hope this tip will be helpful in correcting a similar issue around your home. 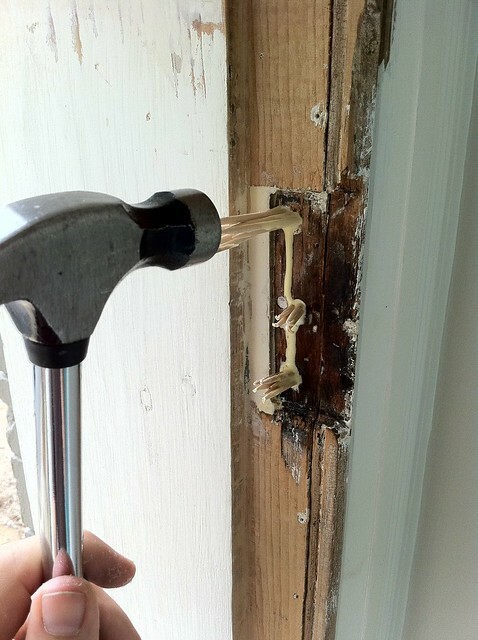 And like I said, you can use this trick for big doors, cabinet doors, or anything that isn't holding a screw any longer. 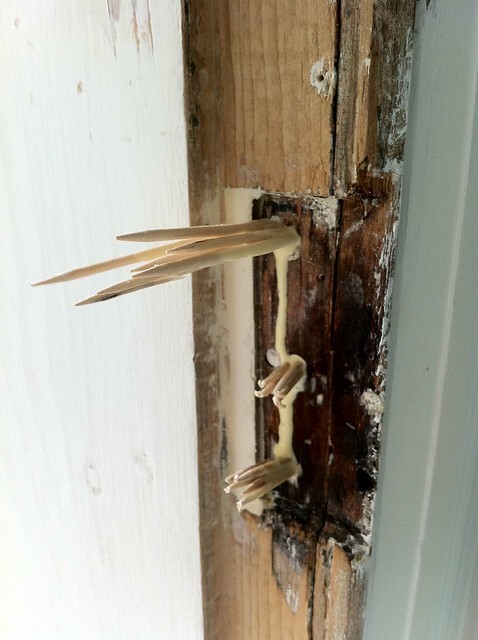 Do you have any tips or tricks for fixing up over-drilled hinge locations? If so, please share, we'd love to hear. Wow, I never even though about doing that. Great tip! I will definitely be using this technique to rehang some kitchen cupboard doors soon. Very clever!! I know this will come in handy some day. I'm really enjoying your door-hanging posts. 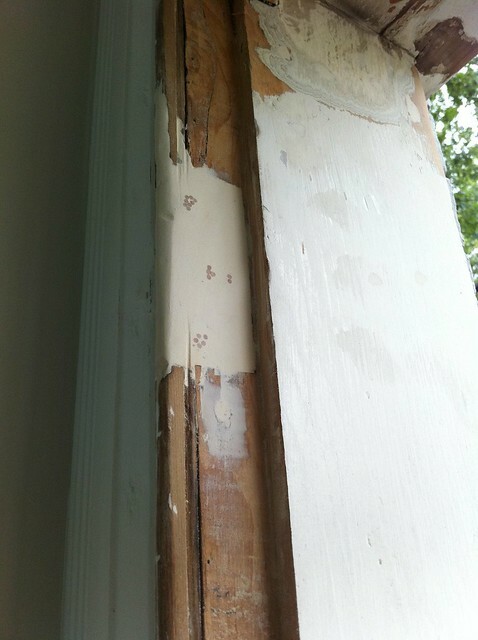 Door frames in old house certainly take a beating over the years and ours are no exception. We're getting close to re/hanging a lot of doors and redoing some hardware too and I'll remember this trick for sure! We used this trick this weekend, and it was a rousing success! We have a strike plate that has been moved several times as the door has settled, and the screws no longer quite stay in. The result? A bathroom door that you occasionally can't close because the loose screws fall out too far.